The European settlement of North America was bad news for wolves, but good news for coyotes whose continued thriving is now threatening the very genetic identity of the wolf as the species cross breed. When the Europeans arrived, the coyote was largely confined to the Midwest, but as white settlers moved across their great new continent, changing its natural ecosysytems as they did, so did the coyote. Now the wild dog is found across the United States of America, bridging Canada as far north as Alaska and even travelling south to Panama. Wolves fared less well - they were a threat to the new agricultural animals that replaced less-settled Native American hunters - and the red wolf is now endangered along with the Great Lakes wolf which could, according to some scientists, be an entirely separate species. Reporting in the Journal of Mammalogy, scientists have used the animals' faeces to identify hybrid species as coyotes move into northern parts of Virginia in recent decades. When the Europeans arrived they found around two million grey wolves in the US, now there are something in the region of 70,000 and cross breeding with coyotes is, say the researchers, one of the main barriers to efforts to halt this decline in numbers. The scientists set themselves the unpalatable task of analysing coyote droppings to find out where they had come from before heading into Virginia - the last coyote free part of the States - from both the south and north. 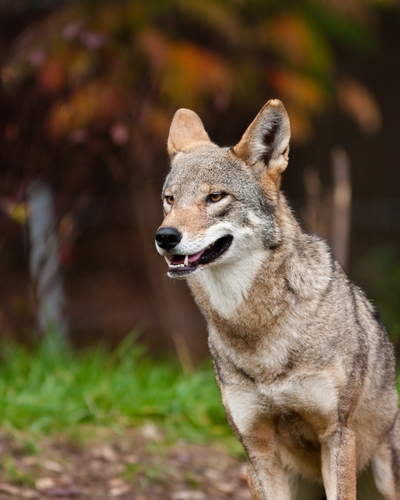 The researchers used groups of genes to identify the original populations from which the coyotes had moved. They found that wolf DNA had started to mix with that of coyotes and where it had the animals also showed changes to their skulls and their teeth that indicate a new species is being born. The first crossbreeds had DNA from the Great Lakes wolf but now scientists fear the new wolf/coyote is moving into red wolf hunting grounds. Listed as "critically endangered" a programme is underway to release captive-bred red wolves back into the wild which could be threatened if the animals continue to cross breed.